For Project Run and Play’s final week the theme was special occasion. I decided the night before it was due to participate. I was really not going to sew along that week because I had WAY too many other projects going, but then I thought of a dress for Bean’s birthday (in May) and I couldn’t get it out of my head. So I started, but did not have enough sewing time to be able to finish in time for the sew along. I knew KCW was coming so I let it go and planned to finish it during one of the hours of sewing this week. The main idea for this dress was to use a similar shape to the bodice from the Natalie Dress (affiliate link) from Peek-A-Boo Patterns (I am in LOVE with that sleeve so there will be a lot more of this shape to come), but to use some lattice smocking across the front. I finished the lattice smocking last week and posted the pic on Instagram. The neckline didn’t stretch as much as I would have liked so I put in a button placket on the back. I like the look it gives the back so it was a happy accident. For the skirt I wanted something full and a little longer than I normally like Bean’s skirts to be. Her birthday is in a month so she may grow between now and then and I wanted her to be able to run and play at her party without worrying about the wind blowing it up. 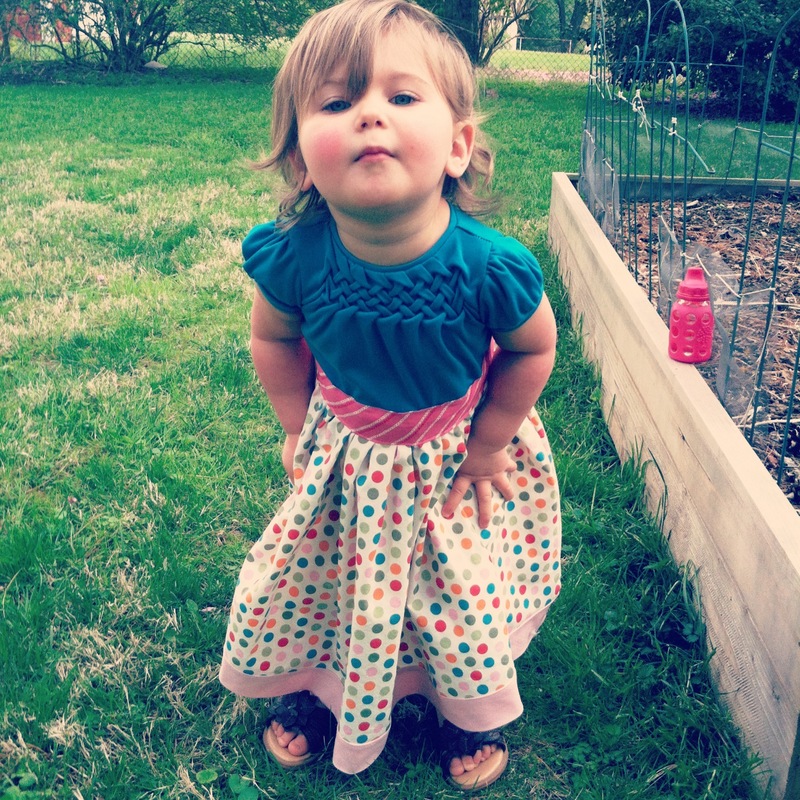 I thought it would be fun to use the same fabric I used for her birthday dress last year (the Ice Cream Social Dress from CINO), so that is what I used for the skirt. I just put a band of pink around the bottom to weigh it down a bit and add a bit of color to the edge. Whenever I use a knit for a bodice with a woven gathered skirt I find where they meet wants to pull the knit a little too much and it widens more then I’d like. So I planned to add a band around the waist. I thought this bright pink against the blueish green bodice would look a little cupcakey which is fun for a birthday dress. I don’t even know what cupcakey means, but it was the thought I had in my head the whole time, hehe. This is Bean’s newest “smile” face. It makes me laugh so hard. I just adore this dress. It turned out exactly how I pictured, and in spite of the number of days it took for me to finally finish it, it was a really quick dress to make. As for KCW Day 3, I still didn’t touch the jacket pieces. 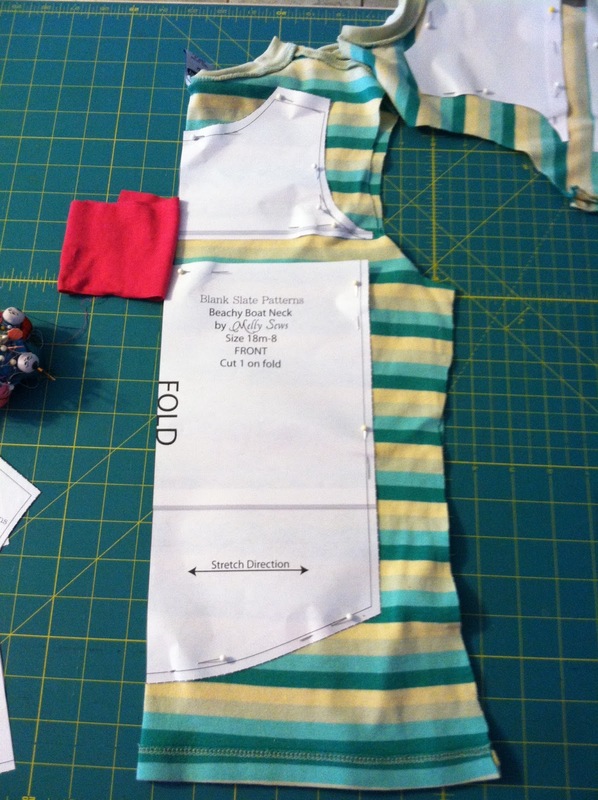 Instead I cut out and prepped a Beachy Boatneck (affiliate link) dress. I have been wanting to make a dress length Beachy Boatneck since pattern testing and decided it had to move up the list above the jacket. And of course I finished the birthday dress. Hopefully day 4 will be productive! 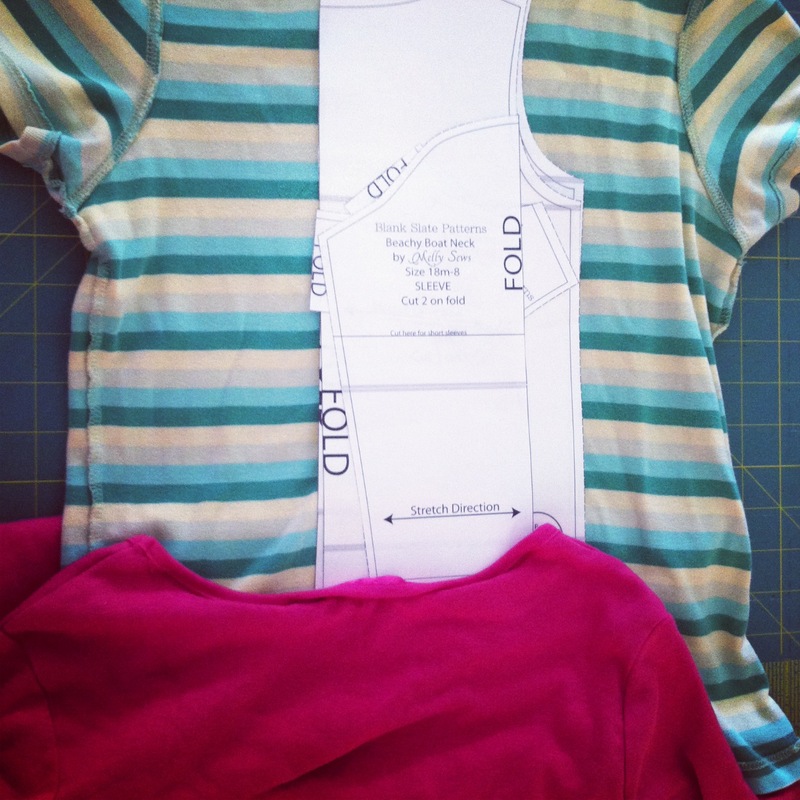 I have added affiliate links for Blank Slate Patterns and Go To Patterns on my sidebar as well as in some of the links in this post, but I sewed using their patterns long before even considering it. These are just great patterns that I truly stand by and I am excited about being an affiliate. Michelle, I do plan to do a tutorial for the smocking in May. I hope you'll find it helpful. 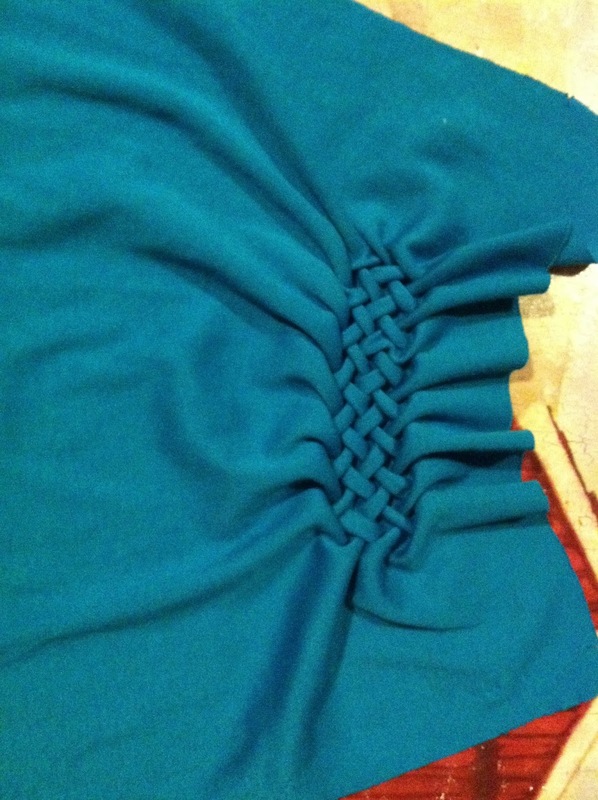 I second the smocking tutorial!I really like this lattice look. She is so stinkin cute, the smile face is great! She looks like she's kissing the camera. I love the length of the skirt and the polka dots. This kid will think every birthday requires wearing polka dots. Can you picture when she's 75, still wearing polka dots? She'll be so on trend. Cute b'day dress and the smock is amazing! Love the dress! I've always wanted to put lattice smocking on something! the dress! That lattice-work knocks my socks off! The dress looks great on her! Love that polkadot fabric and blue top! Thanks for sharing at Submarine Sunday! What a beautiful dress!! Love the smocking!! !